The Gunpowder 50K was the inaugural event with this course and name in Gunpowder Falls State Park. 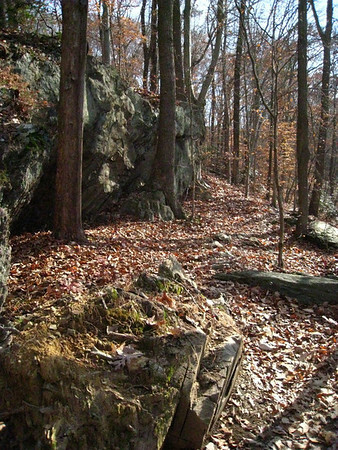 An out and back course starting at the Gunpowder Lodge running through Gunpowder State Park the race description "The Gunpowder trail provides various challenges ranging from rocky terrain, continuous climbs and questionable blazes." I only had problems at the turn around where I couldn't see the aid station and about 6 miles from the finish where I was lined up just right to not be able to see the next blaze or bit of marking tape. It was an attractive course but apparently the leaves just fell in recent rain covering the otherwise very visible trail. The race went fairly well for me. I finished 50 minutes faster than my last 50k but started having some discomfort with my left knee around mile 12. On the return I ran for a while chatting with some mountain bikers thinking that we must be crazy to be running 30+ miles. It felt to me like it was turning into a race for last and for the first time ever in a long race I actually tried to race instead of finish or just better my previous results. I pushed to get back over the hills to the rock scrambles and corners to stay out of sight but it didn't work. As it turns out I was feeling generally fine except for the nagging pain in my knee which turned into an inability to effectively run downhill. With maybe six miles to go I had difficulty finding the course and stopped for a minute looking for blazes while doing that my ITB tightened up. I started hobbling to the end and on the way my ITB loosened allowing me to run on and off but never got back to the point where I was running comfortably. At the 4ish mile aid station I stopped to write in my time and the delay had me hobbling out the other side on a horse trail. Steve pulled up and asked if I was okay and I jokingly allowed with a grin that I might drop at the next aid station (the finish). At 2-3 miles he was waiting at the last road crossing to pull up the signs asking if I needed anything (maybe I looked really bad the last time he saw me?). With about 2 miles left I realized I was close to shaving an hour off my last 50k. Fortunately the last bits were mostly flat. Unfortunately this is also where I tripped on a root onto a nice truly soft bit of trail, I rolled through the fall and kept running but noticed that I needed to finish the last however long in 30s and I still couldn't see the finish. I backed off to a hard but runnable (for some values of running) pace. I got to the line DFL to cheers from finished runners at the outside tables and the crowd still at the line. This was the first time I really noticed any ITB tightness/pain and I attribute it to the heavy racing/training schedule at the end of the year. I'm still recovering a bit with a foam roller stretches and massage and think I am managing the recovery nicely so far.